Dewi Griffiths produced a fantastic marathon debut clocking 2:09:49 for a fifth-place finish at the Frankfurt Marathon today (October 29). The performance catapults Griffiths to number two on the Welsh all-time list, behind the great Steve Jones, and number 15 on UK all-time list. 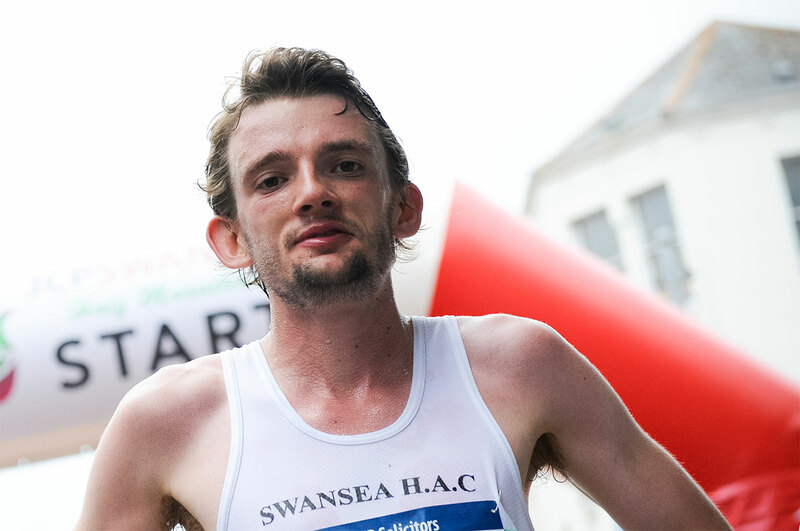 The Welshman, who has shown brilliant form in recent weeks, including a lifetime best of 61:33 at the Cardiff Half Marathon had garnered the attention of the UK running community in anticipation of how he would fair over the 26.2 miles distance. In windy conditions, it was no surprise that a leading group kept together through half-way, as seven athletes clocked 62:30. The leading British entrant Griffiths was running alongside the home country’s record holder Arne Gabius. At halfway the two athletes ran in a second group and posted a 63:49 split. 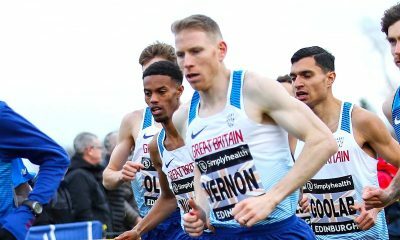 By 30km, Griffiths had opened up a gap of 21 seconds on the German athlete and found himself running strongly in sixth position but slightly isolated, with a distant 1:40 behind the nearest competitor. However, the grit and determination saw Griffiths close this gap and as the final 12km unfolded the Welshman moved into fifth place. He held this position to the finish and was rewarded with a blistering time of 2:09:49. The race winner was Shura Kitata Tola of Ethiopia in 2:05:50, ahead of compatriot Kelkile Gezahegn Woldaregay in 2:06:56. And completing an Ethiopian podium was Getu Feleke Zegeye in 2:07:46. Behind, the German athlete rallied to sixth place in 2:09:59, pleasing the home crowds within the finishing stadium. Ahead of the Frankfurt Marathon Griffiths told Fast Running: “I’ll be on the start line on Sunday in the best shape of my life and we will find out whether I’m a 10k guy or a marathon runner” – I think we now know! Other British results include; Nicholas Torry of Serpentine, who passed the halfway point in 68:01 and the Vet 40 athlete maintained great form to finish with a time of 2.17.37. Lee Merrien of Guernsey was aiming to make the Channel island’s Commonwealth Games Team and had a 2:20 target. The Olympian who has not had the best of build-ups to today’s event finished in 2:20.25, narrowly missing the qualifying standard. Ronny Richmond of Bideford AAC and Ollie Lockley of Manx Harriers ran 2:23:37 and 2:25:28 respectively. Tom Evans of Lewes, recent Peterborough 10 mile victor, was also making his debut over the marathon (if you discount the deceptively named Marathon des Sables!) The ultra-running specialist has shown great form over shorter events, running 15.01 for 5km this Summer and for 51.46 over 10 miles. He will be disappointed with 2:26.07 in Frankfurt but has great potential over the distance looking at his already impressive resume this season. In the women’s field, it was the talent of Vivien Cheruiyot who led for the majority of the race. 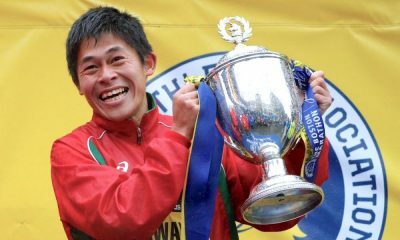 Although she went into the race with faster athletes in terms of previous marathon times, the pedigree of the Kenyan athlete was always going to be hard to beat. At halfway she ran 70:07 and had a lead of over 2 minutes on her closest competitors. In the second half the win was almost certain and sheltering became a priority for the diminutive figure. She crossed the line in 2:23.35, Melese Yebrgual Arage of Ethiopia had a strong second half to place second in 2:24:30, closely followed by her compatriot Assefa Meskerem Womdimageyn in 2:24:38 for third. Sara Hall of the USA travelled to Germany stating she wanted to run this marathon “as if it were her last.” She executed an evenly paced race to finish fifth in a new PB time of 2:27:21. On a domestic front, it was Rebecca Hilland who led the list of British entrants. 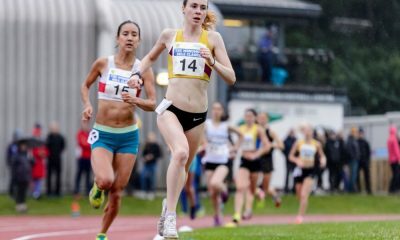 The Bath AC athlete in recent weeks has both narrowly missed her half-marathon PB in Manchester then recorded a 10km lifetime best just last week. 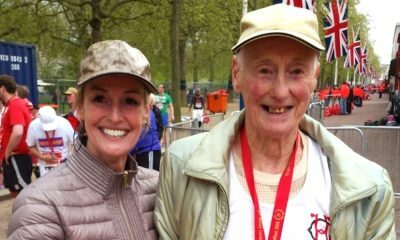 The aim was a personal best in Frankfurt to better her 2:39:45 from the 2016 London marathon. After passing halfway in 78:01 Rebecca started to struggle and was being sick, forcing a retirement from the race. The Norwegian based athlete will look to recover and possibly target another marathon to cap her fantastic Autumn. Northern Irish athlete Fionnuala Ross had also enjoyed a rich vein of form leading up to Frankfurt, including, third in Glasgow at the Great Scottish Run, however, the Shettleston Harrier runner found Frankfurt to be a tough day at the office, finishing with a 2:48:44 to her name. RELATED: A review of this weekend’s top UK running, including the Scottish National Cross Country Relays, Snowdonia Marathon and the Accrington 10K, can be found here.